Acupuncture is an ancient form of Chinese medicine involving the insertion of fine, sterile, one-time-use needles along 14 Meridians located in very specific points on the body where nerves and receptors are found to achieve a therapeutic effect. No drug is injected. The needles alone create the beneficial effects to clear energy blockages and encourage the normal flow of qi through the individual. The practitioner may also stimulate the acupuncture points using other methods, including moxibustion, cupping, electo-stimulation and massage in order to re-establish the proper flow of qi and restore homeostatsis. Assists in the prevention against of disease and illness as well as the maintenance of general well-being. Acupuncture is safe and effective and is often successfully used as an alternative to medications or even surgery. 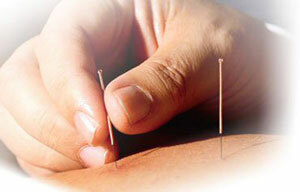 Relief is often obtained with acupuncture when traditional medical therapy has failed.